Unless we have company, I usually do not prepare evening snacks. A cookie or a toast is good enough with our evening tea. We like an early dinner. It isn't like that at my parent's place. They like to munch on something for tea and then have dinner around 9 - 9:30 at night... sometimes even later. Not a very healthy habit... but that is how it is... Earlier, when I was small my mother used to prepare one sweet and one savory snack everyday. Again not healthy... but that was how it was.. With time the number of snacks reduced to one but she still makes a little something everyday... and sometimes when I ask her for ideas for the blog she tells me what she prepared the evening before. That is how I was reminded of this Nariyal Samosa.. 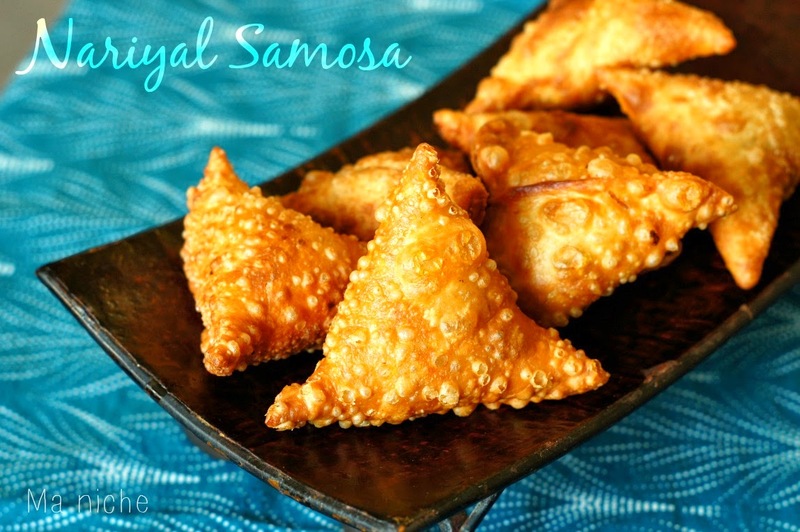 These samosas are a bit different from the ones that you get in the Indian stores. Typically it takes some time to prepare the stuffing for the Samosas.. but you barely need to no anything for these. Just spice up some grated coconut with green chili, add chopped onions and coriander to it, squeeze some lime juice, season with salt and sugar and your stuffing is all set. After the Indian-Pakistan partition, owing to the unstable job scenario in Bangladesh, many of my mother's cousins from Bangladesh came to India and lived with them for a good many years. That meant that in addition to her family of five, my grandmother had to prepare meals for four to five more people everyday for all those years. I guess quick-fix snacks and meals would have been her saviors during that phase.. 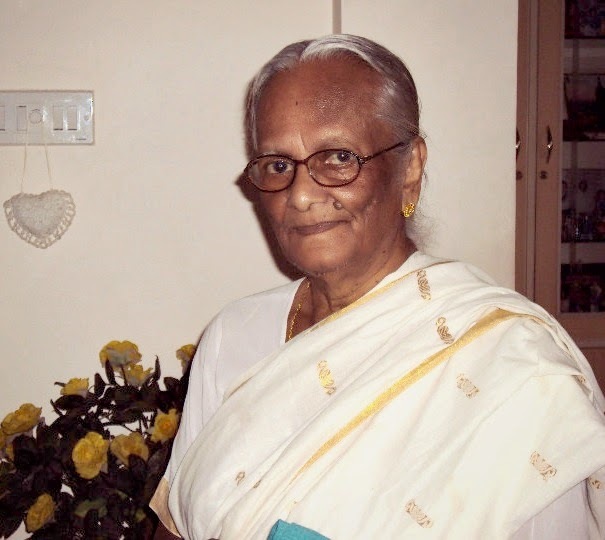 I am not sure if she bickered about the extra work load back then.. but in the years that followed I have only heard my grandmother, mother, uncles and aunt talk very fondly of the times they spent together.. I made these a couple of week's back when my cousin was here. She helped me take the step-wise photographs that you see below. 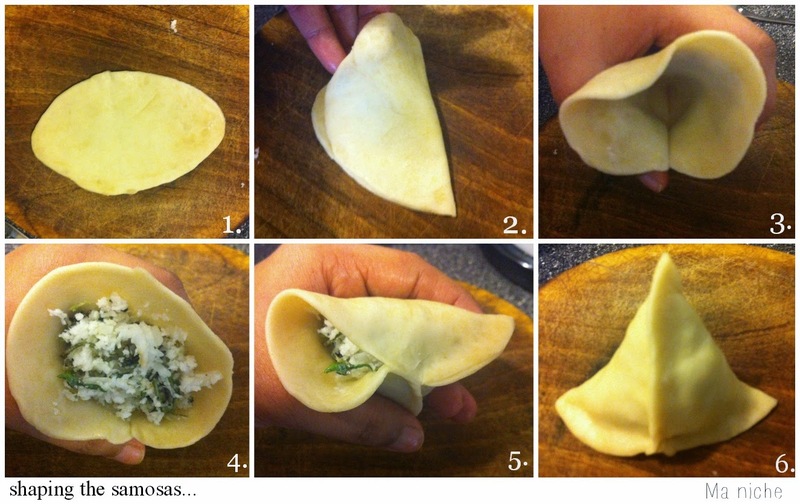 In case the samosa fold feels like too much work, fold the dough empanada-style and fry them. I do not when I have to make bigger batches.. Mix the flour semolina and oil. Gradually add the water to the mixture and knead to make a soft dough. Keep aside for 10 minutes while you prepare the coconut filling. Mix the ingredients for the filling. Taste and adjust the lime juice, salt and sugar. Divide the dough into 12 lemon sized balls. Roll the balls into 5 inch long and 1¾ inch wide ovals. When all of them have been stuffed and shaped, heat enough oil(about 2 ½ -3 inches deep ) in a large kadai. To check if the oil is hot enough, drop a small piece of dough in it; if it sizzles right away and gradually floats up to the surface then the oil is ready for frying. Now turning the heat to medium low, carefully place the stuffed samosas in the oil. Do not overcrowd, fry only a few at a time. 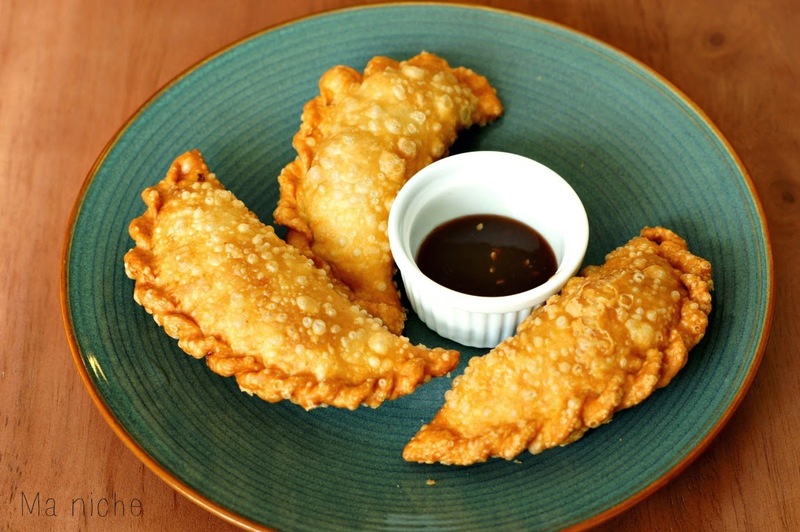 Once the samosas float up to the surface, turn them and fry until they turn golden brown. Then lift them out with a slotted spoon and keep aside. Serve with sauce or chutney and enjoy. I shall be sharing this at the Swati's FR Event that I am hosting this month. I shall also be sharing it at all these parties.. These look so yummy! 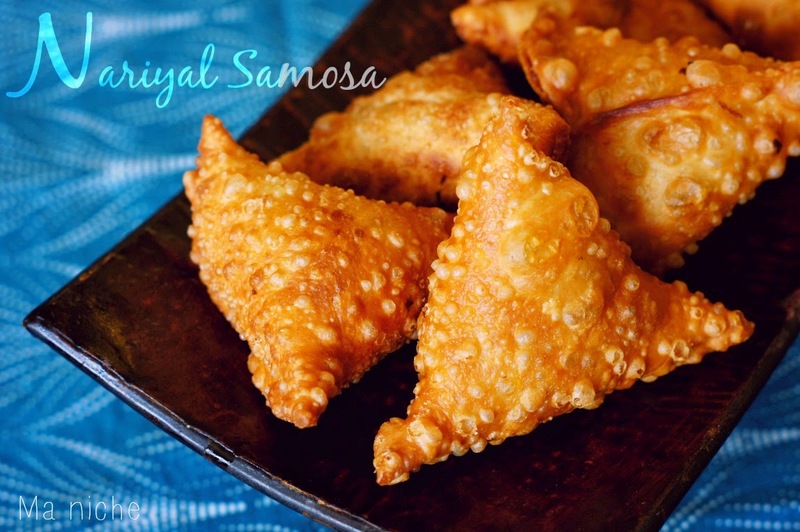 I love samosas but never considered trying to make my own again. Thanks for sharing, I really can't wait to try! Lime and coconut is such a unique combination. Delicious samosa Love the nariyal version Tanusree. Thanks for sharing with Hearth and Soul blog hop. 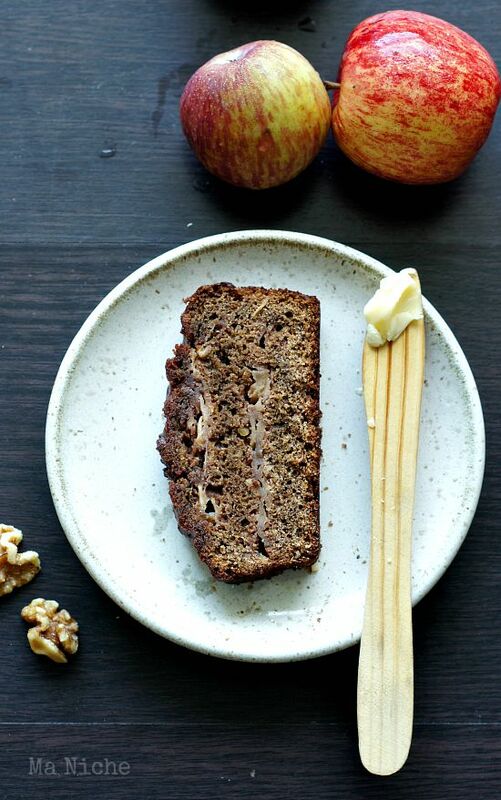 Your Grandmother is such a lovely woman and I am sure this recipe is so special to you. It looks amazing! 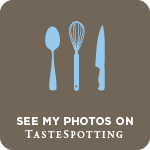 Thank you so much for sharing your special post with Full Plate Thursday. Hope you have a great week and come back soon!